Yesterday, while sitting in the passenger seat, enjoying yet another Illinois cornfield, I passed some time with Facebook, Twitter, texting and Google maps. (Isn’t wireless data access a wonderful thing?) I was wishing I could pass some time reading news, email newsletters, and blog posts via Feedly, a wonderful desktop service that assembles all my news and blog feeds into one nice, easy to read magazine-like page. I’ve used Feedly for quite a while now and love it – it basically lives in your web browser and creates your own personalized reader’s digest for the web on one page. What more could you ask for? But, where was Feedly now? – Sitting on my computer in my bag languishing for want of a wireless connection since my 2002 mini-van isn’t a WiFi hotspot. Hmmm… I wonder if Feedly has an iPhone app? I really enjoy the satisfying feeling of a job well done. I really dislike the stressful feeling of lots of jobs undone that need to be done, but I can’t remember all of them and I can’t remember which is most important and I can’t find the time and I can’t take the first step and the sky is falling NOW!!! I love to-do lists so much that I even imagined what’s on Jesus’ to-do list. It’s a powerful thing, a to-do list. A completed to-do list will put a rainbow on your day better than good coffee n’ dark chocolate. So, imagine my gratitude when a good friend introduced me to the iphone app nirvana of digital list making called, Paperless (cue the angelic choir). 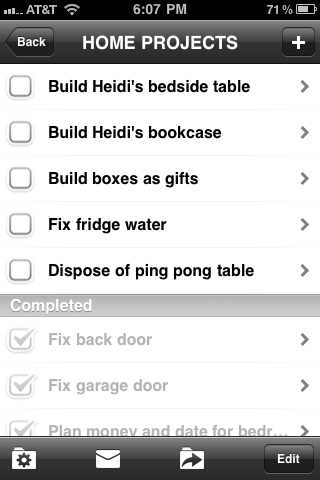 Paperless by Crush Apps is what it claims to be: just lists and checklists. Done brilliantly. No prioritization. No categorization. No synching with your calendar. No tutorials. No nonsense. Just simplicity. Make a list. Or, make a checklist. Add notes if you want, or not. Check an item complete. Or, delete it. Or move it to a different list. Or email it to someone and make them do it ;-). Or, if it’s urgent, just drag it to the top of the list. Done. What could be simpler? I’ve used it for about six months. I love it. I paid the $2.99 for the full version. (The free “lite” version, which limits the number of lists you can make, had me sold on Paperless in about 5 minutes.). I recommend it to all you iphone users. If you like, you can read a Macworld review of Paperless. Here’s the link to Paperless in Apple’s iTunes store. 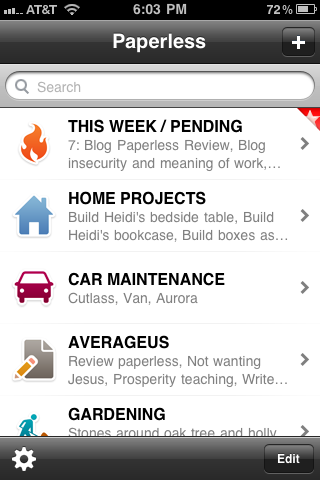 Here’s the link to Crush Apps, the developers of Paperless. I also wrote a review of the Blue Letter Bible iphone app. Right – that’s just meaningless on a lot of levels. But, you get the point. Bible study tools are helpful; “free” and “online” just raises the value into bonus territory. Just like BLB’s web version, the app’s overall design isn’t very appealing and appears a bit dated. Just like the web version, there are lots of non-obvious looking icons you have to learn in order to navigate and use the tools. This lengthens the learning curve and makes getting around the app a little slow at first. Some of the included Commentaries just aren’t very good, insightful, or helpful. They created an auto-scrolling function. Cute, but what’s the point of that on an iPhone? Scrolling is the main way to use an iPhone. I didn’t see any way to look up a simple introduction to a Bible book, for example an introduction to the Gospel of John. You can totally personalize the interface (font size and types, background colors, line spacing, etc) to make it more readable and appealing to your aesthetic senses. See the screen shot at the bottom of this post. The app comes with three English translations installed on your iPhone, with lots more available (but not down-loadable) for free via the web. Split screen comparison view of two versions. Create notes, create your own color-coded highlights, bookmark, organize folders of passages, view history. The best news is that unlike the web version, the BLB for iPhone was created to be useful for daily Bible reading. So, you can use this app to read through Romans 3 before work, look up “propitiation” in Strong’s on your lunch break, and read Matthew Henry’s commentary on it before bed. Pretty handy. The new BLB for iPhone App has lots of value as a daily Bible reader and study assistant once you learn the navigation and icon system. It falls a little short as a “Study Bible” since it lacks the useful book introductions typically contained in one. It’s not perfect, but for now it’s the most useful FREE Bible app I’ve found. If you want to try it yourself, you can find it at blueletterbible.org/iphone.